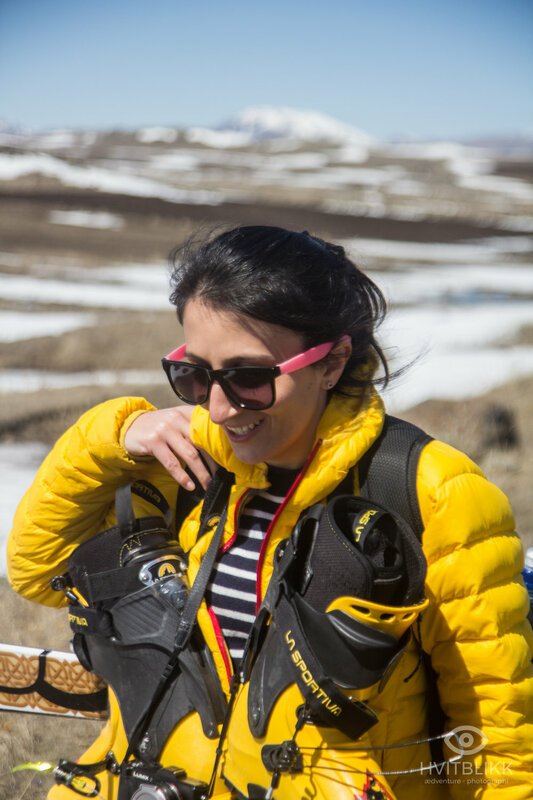 It took me less than 12 hours from I landed in Yerevan, till I was on my first trip in the backcountry. Since it was March 8th, the International Women's Day, its a public holiday like in most former Soviet Union countries. The worst winter cold had just settled and we could enjoy the first spring sun while we enjoyed 20 cm of white gold in Aghveran's snowy hills. In 2017 I spent one month in Armenia to do a documentary reportage on the country`s parliamentary elections. In my month long stay, I saw a country, disturbed by war and natural catastrophes, fall longer and longer down in abysses. But I also saw an amazing country. I came because of friends, the amazing hospitality, the incredible nature - and last but not least, to ski. In this occasion, I wrote an article for the norwegian skiing magazine "Fri Flyt", in its 2018 january edition. Here are some unpublished pictures from the country where East meets West. A country filled with charm, incredible nature experiences, a wonderful blend of pride, hospitality and religious fanaticism. 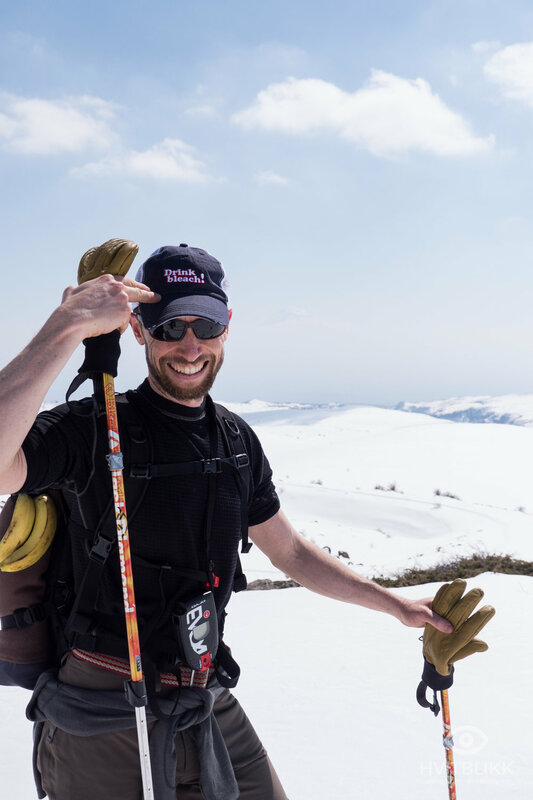 Welcome to Armenia - more then just a ski destination. The Ararat Mountain is very important to the Armenian people, and they are almost religious about it. It is perhaps not so strange, since it was here Noah, according to the Bible, landed with his ark after the big Flood. What worries the Armenians, is that the mountain is now situated in Turkey. So even though the mountain is clearly visible from the capital Yerevan, it is still so far away, behind closed boundaries. The mountain is truly magical, here seen from the country's current highest mountain, Mt Aragat. Former Sovjet Republic in Caucasus. Independet in 1991. Language: Armenian, Russian and to some degree english. Ski-facility: Tsakhkadzor. 6 lifts with 27 km slopes and 853 meter altitude difference. 22 €. Aparan, Aghveran, Yeghipatrush, the curch Tsakhevank at the foot of Mt Araler, and Melikgyugh. The road to Aragats goes trough Byurakan. 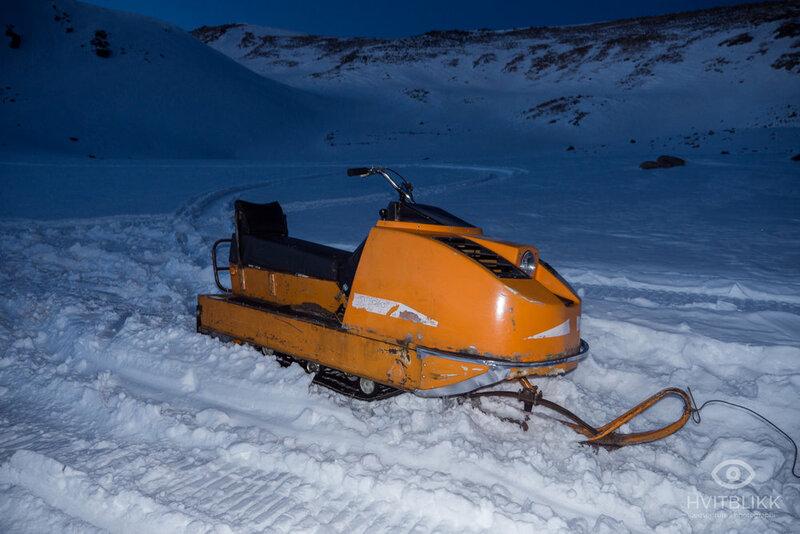 Armenia's rugged landscape does not always provide good forest skiing, but the valley around the village of Aghveran is one of the exceptions. 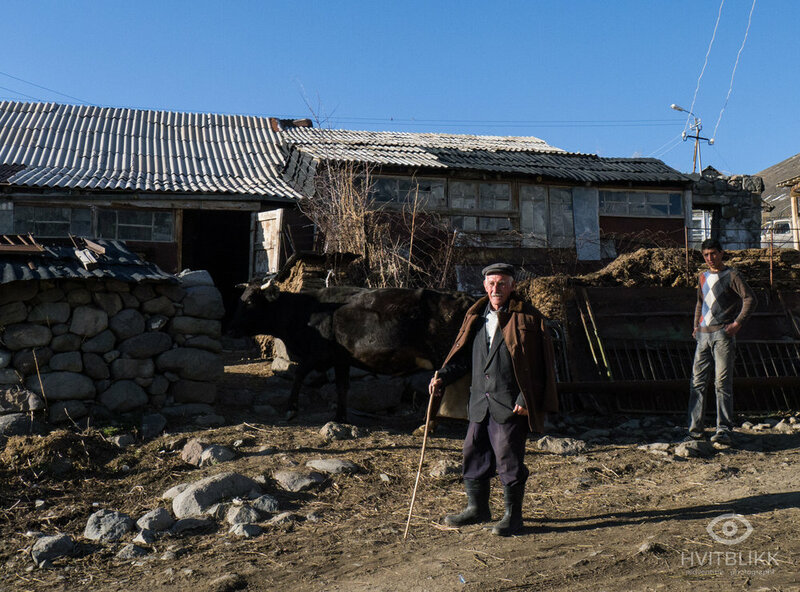 Armenia is a sparsely populated country where the majority of the population lives in urban areas. The countryside is poor and people often works in the mining industry or farming. Most of the time its all abandoned. Nevertheless, small remote villages like this, Melikgyugh, provides a good access directly into the mountains. Armenia is the first country in the world who got Christianity as a state religion. Ruins of once magnificent churches are often seen in nature. Here we are in an eremite cave at the Arals mountain. The cave is an old church, and according to rumors, men is still taking kidnapped brides here, to complete the marriage. 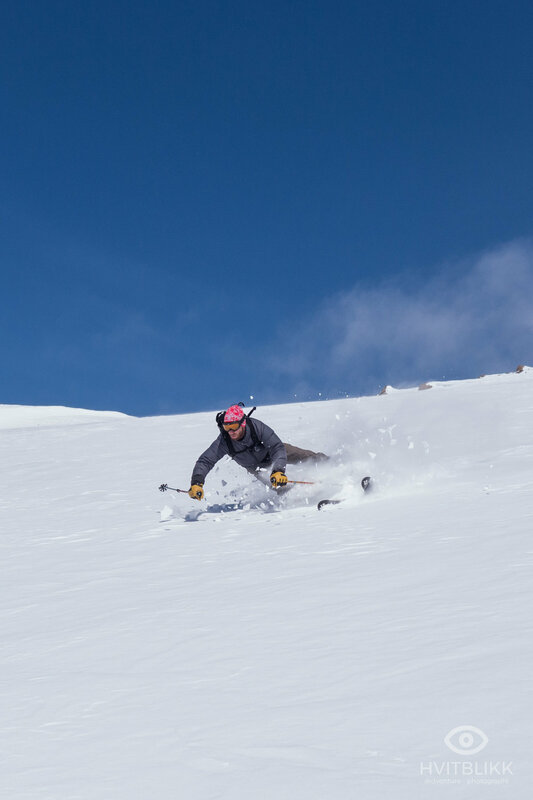 Mt Araler does not only have a religious mysticism, but also offers exciting opportunities for good skiing. Here, Christoph Herby enoys the deep telemark turns, just an hour's drive away from the city of Yerevan. 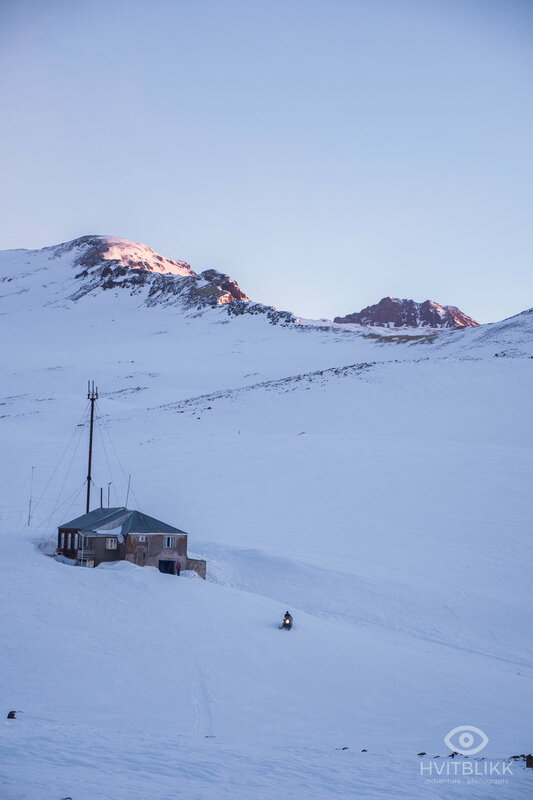 At a height of 3200 meters above see level, just below the top of Armenia's highest mountain, Aragat, there is a metrological station where you could spend the night. 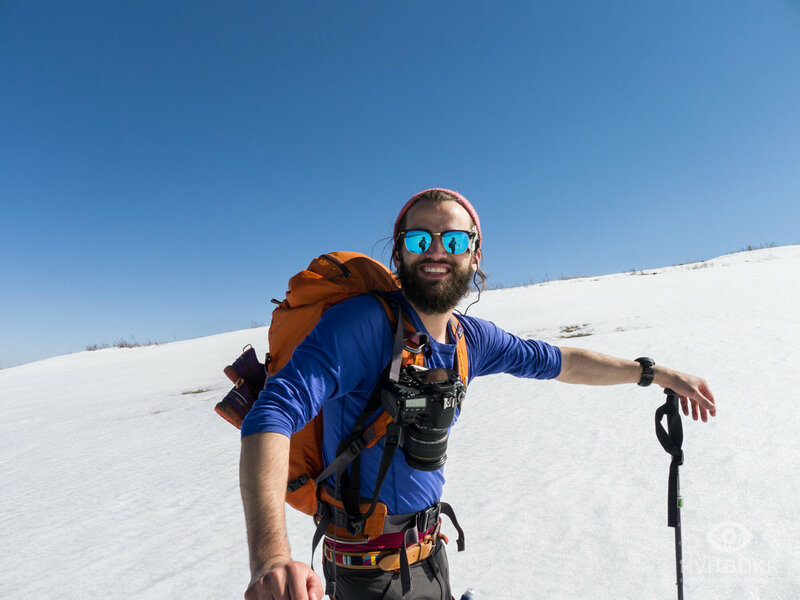 The conditions are simple, but it gives greater access to the highest mountain early in the season. Later in the season there is an open roadway up to the station. 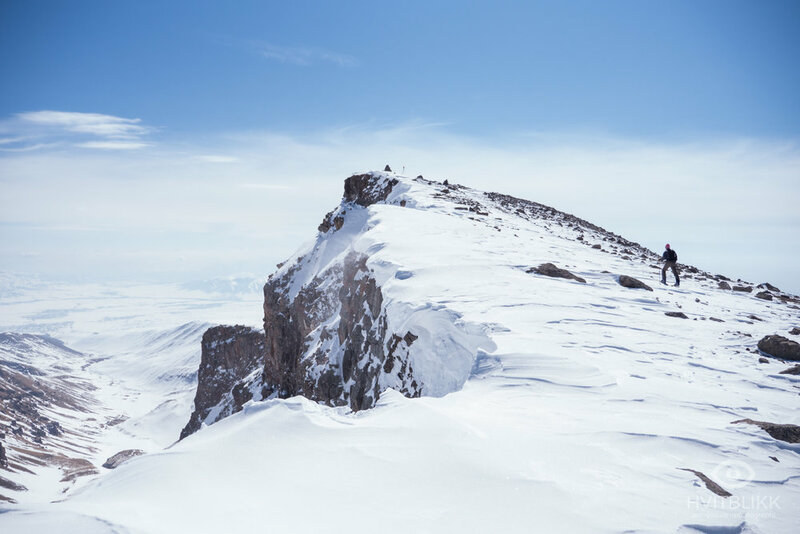 Aragats er en gammel vulkan, og gir en spennende skikjøring i et noe goldt terreng. På grunn av høyden og det tørre klimaet kan derimot snøen være utfordrende, med lite og hard snø. Nede til høyre kan man skimte forskningsstasjonen hvor vi overnattet natten før. 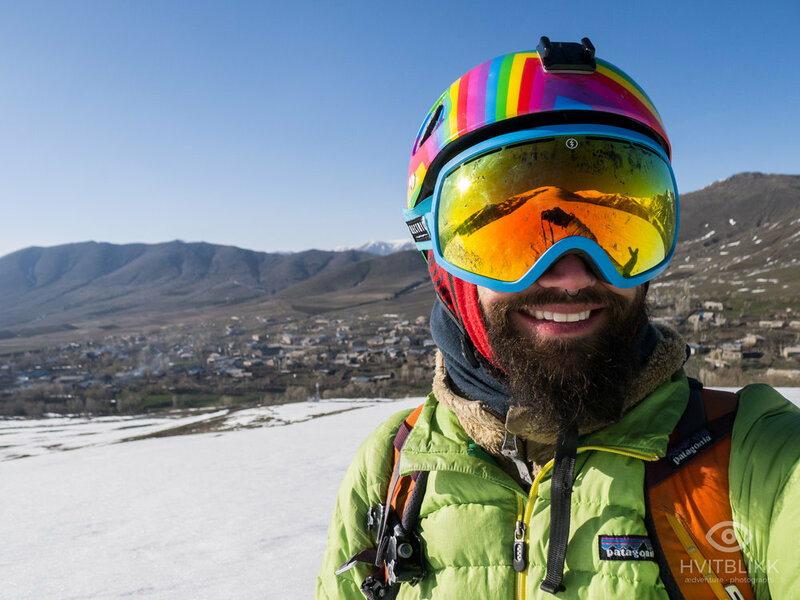 A ski trip to Armenia is about so much more than just skiing, and provides a wonderful journey to a country filled to the verge of history, contrasts and hospitality.